Sometimes a brand emerges on the beauty scene that captures your heart within a short time, the bond becoming stronger with every new product launch. This doesn’t happen often to me, making Aurelia Probiotic Skincare even more special, as far as I am as consumer are concerned. 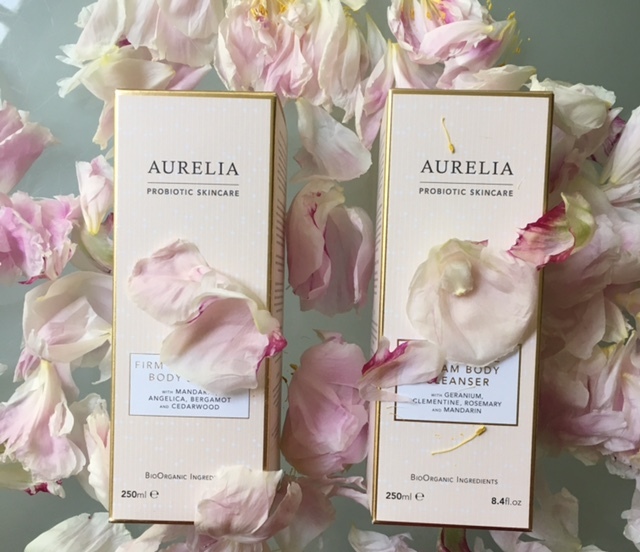 Aurelia Restorative Cream Body Cleanser & Firm & Replenish Body Serum were launched in late spring and having tested both of them since early May, to say that I am smitten would be pretty accurate. One of the main reasons being that both products treat not just the body, but mind too. As a busy woman I appreciate it more & more. Our faces are our calling cards, so we lavish out attention on them, often neglecting our bodies, which isn’t smart in the long run. When it comes to the products that I use in the shower, I prefer natural formulas, scents that make me dream, rather than choke and no less importantly, make my skin feel nurtured, rather than carelessly attended to on the run. When creating the formula for the Restorative Cream Body Cleanser Claire Vero, Aurelia’s founder, mother of one, with another baba on the way, ‘wanted to create beautiful skincare that surpassed the biggest expectations of modern women’. Combining the science with ethical, sustainably sourced BioOrganic ingredients, she managed to create product that caresses your skin, while making you feel feminine and confident in your inner power. Don’t be surprised, if your Aurelia skincare helps you make male hearts beat just a little bit faster, as well as garner compliments from other women. And remember that a confident woman is easy to spot, as she makes others feel good about themselves, because she is innately confident in her own abilities, strengths and even weaknesses. The cleanser has natural coconut creamy base and lathers, not surprisingly, very well, covering the body in tiny cleansing bubbles that respect your skin’s natural Ph balance. I emerge from the shower (aim to use cool, rather than hot water, as the latter tends to dry up your skin) with my skin feeling clean and hydrated. There are often times that it feels so soft & silky to the touch, that I don’t apply anything to it, just leaving it slightly damp & letting the scent linger, making me feel like I am floating in my own feminine cocoon. When I use it in the evening I let the water wash away the worries and stresses of the day, while the cleanser helps get rid of the pollution & negative vibes that get accumulated by all of us living in busy, congested cities. The cleanser is suitable for all skin types, including sensitive and has been dermatologically tested. In terms of key ingredients you have restorative botanicals, namely Baobab, Kigali Africana, Hibiscus (rich in Vitamin E) which enhance cleanser’s antioxidant & nurturing effect on your skin. Aloe Vera soothes & heals skin’s top layer and essential oils, expertly layered and steam-distilled, create a fragrant veil over your skin, while delivering therapeutic benefits via your sense of smell. Geranium, combined with Clementine Oil, offer delicate floral notes that lighten the mood and your step. There is also uplifting Mandarin for elevating stress and tension accumulated in the body, while Rosemary is added for focussing your mind on things that matter. Stepping out of the shower, after using this cleanser, makes you feel light, energised & confident in who YOU are. Ingredients list: Aqua/Water/Eau, Aloe barbadensis leaf juice (Aloe vera), Sodium cocoyl isethionate (coconut based), Prunus amygdalus dulcis (Sweet almond) oil, Stearic acid (vegetable based), Glycerin (vegetable glycerine), Hibiscus sabdariffa flower extract, Kigelia africana fruit extract, Adansonia digitata fruit extract (Baobab), Citrus clementina peel oil (Clementine), Citrus nobilis (Mandarin orange) peel oil, Pelargonium graveolens flower oil (Geranium), Rosmarinus officinalis (Rosemary) leaf oil, Cymbopogon citratus leaf oil (Lemongrass), Cymbopogon flexuosus oil (Malabar grass), Lavandula angustifolia (Lavender) oil, Cananga odorata flower oil (Ylang ylang), Decyl glucoside (sugar based), Glyceryl caprylate/caprate (vegetable derived), Sodium cocoyl glutamate (coconut based), Xanthan gum (natural), Lactic acid (natural), Potassium sorbate, Hydroxypropyl guar hydroxypropyltrimonium chloride (vegetable based), Salicylic acid (vegetable based), Citric acid (derived from lemon), Allantoin (vegetable based), Sodium phytate (derived from rice), Sorbic acid (natural preservative), Benzyl alcohol, Dehydroacetic acid (natural association approved preservative), Limonene*, Geraniol*, Linalool*, Citronellol*, Citral*, Benzyl benzoate*, Benzyl salicylate* (*naturally occurring in essential oils). The serum feels light-weight, but it does moisturise the skin better than many of the body creams or serums that I have tried in the past. It also delivers antioxidants & omegas, as well as exquisite fragrance, which is summery & easy on the senses (a combination of Mandarin, Angelica, Bergamot & Cedarwood provide an uplifting cocoon for your skin to be in), making it practical & effective, something that isn’t easily found when it comes to body care in the home environment. Adding Shea and Cocoa butters to the formula (not that you would guess, judging by the lightweightness of the serum) helps to soften the skin, as well as smooth it and I noticed an improvement in my skin’s texture after only a couple of weeks of regular use – by regular I mean every other day. There are also added benefits of the Argan oil that helps to hydrate the skin, making it a really effective product for the ‘ravished’ skin – be it in cold or hot months of the year. It works particularly well on your legs, when you don’t have a natural suntan, but wave goodbye to wearing tights. Most of us don’t drink enough water daily and over time one starts to notice the difference in the skin, particular in the areas that tend to be drier, like elbows and knees. This serum is also non-greasy & doesn’t leave behind any extra residue – just well-moisturised, more even & visually plumper skin, which is smoother and softer to the touch and is a simple joy to be in. In addition to visually noticeable benefits, there are also sensory ones. Uplifting Mandarin is blended with Angelica Root to calm, while Lemongrass invigorates and Chamomile helps to relax, with notes of sweet Bergamot & grounding Cedarwood completing the blend. What makes Aurelia particularly special is that due to the unique scent of each product for the face or body, men really notice the scent and end up complimenting women who use the products – while this might sound superficial to some of you, I draw pleasure in using products that help me feel good about myself, while making my skin look good. Additional compliments are a welcome bonus.